Breaded chicken covered in fresh mozzarella and homemade tomato sauce served with a side of spaghetti pomodoro, potatoes and vegetables. 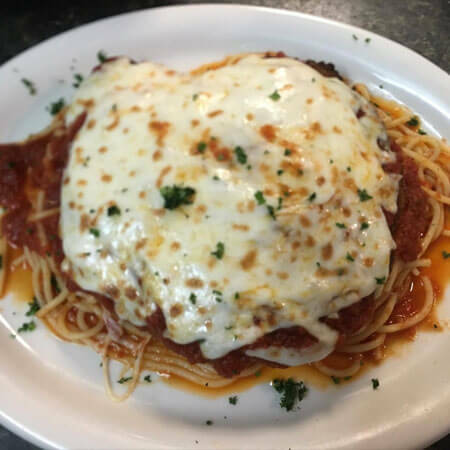 Breaded eggplant covered in fresh mozzarella and homemade tomato sauce served with a side of spaghetti pomodoro, potatoes and vegetables. Tender chicken scallopini and mushrooms in marsala wine sauce w/ a side of steamed vegetables. Breadstick encrusted chicken breast topped w/ field greens, homemade mozzarella, tomato & onion tossed in ceaser dressing. 8 oz. salmon fillet topped with Italian seasoned breadcrumbs, served in a light butter, lemon, and white wine sauce. Linguine tossed with fresh clams, roasted garlic and basil in a white clam sauce. Salmon sauteed in a lemon, white win sauce with capers. Shrimp and peas tossed with fettuccini in our homemade alfredo sauce. Fusili pasta sauteed in a spicy white win tomato sauce topped with shrimp, arugula, & garlic.